Description Note the addition of 11 wt and 12 wt 1.5 - 2.0 ips clear tip line in 2014 to meet angler demand. 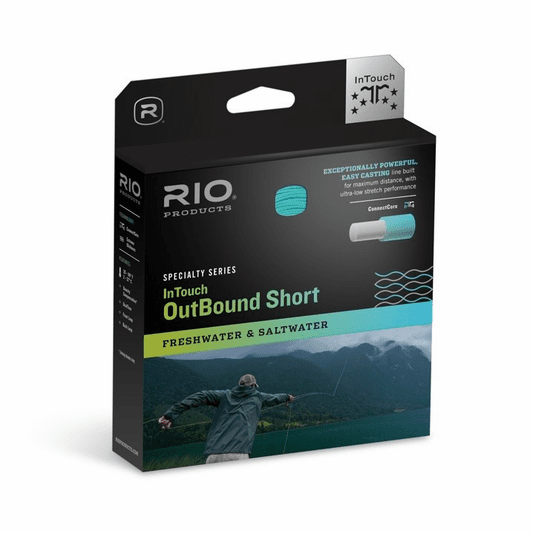 The Rio In Touch Outbound Short Coldwater Series is an updated line for 2013, and as close to a MUST-HAVE fly line for all size quarry to cast large or weighted flies in wind with fast action fly rods. Rio's number one line for ease of casting all sizes of flies on fast action rods for any species from trout to Albacore and larger- anywhere cold and temperate waters and fish roam about looking for flies to chomp. What is an Outbound Short Coldwater fly line? This is a Rio specialty fly line that packs the rod loading punch of a stout Integrated shooting head into a mere 30 ft. Shocking. What is so special about a ConnectCore fly line? 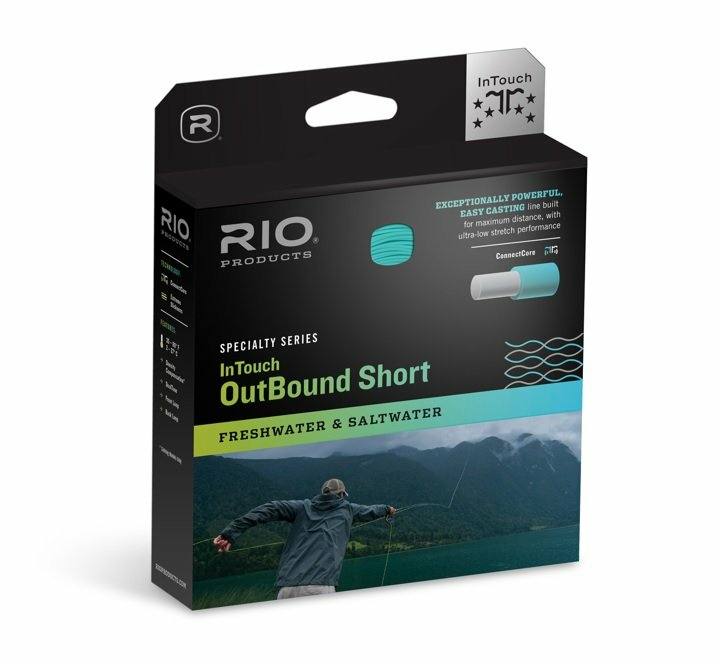 Rio is increasingly incorporating the Connect Core into their premier fly lines because these line cores stretch less than 3 percent versus over 22 percent for traditional fly lines. Less stretch means better feel, hook setting, and more effective presentations too. So when you see In Touch or ConnectCore it is good and means a represents a superior fly line for all applications. What is a Coldwater fly line? This is a fly line specifically designed with a coating that does not become overly stiff (and make casting a chore) at temperatures in the 50 - 80 Degree (F) range. Easy rod loading. Rio's decision to design and produce integrated head shooting fly lines that are heavier than the usual line-class standards is a carefully calculated means of achieving rapid rod loading with only a little line in the air. This feature allows one to obtain full-fledged line-loading from modern fast actions fly rods. Performance in windy conditions. The Outbound Short gives the wading angler the advantages of this ultra short, aggressive head that will load your rod and punch a fly with superior authority. Full floating line - Moss/Ivory line wts #8-10. Floating line with a 15' green 1.5 ips Tip - gray/Ivory/green line wts #5-10. Full Intermediate line with a 30 ft translucent yellow 1.5-2.0 ips Head - line wts #6-12. Full Intermediate line with a 30 ft Black 6.0 ips Head - line wts #6-10. Welded Loops: The front and back ends of In Touch Outbound Short Coldwater fly lines provide welded loops to ease the process of quick rigging and attaching leaders.